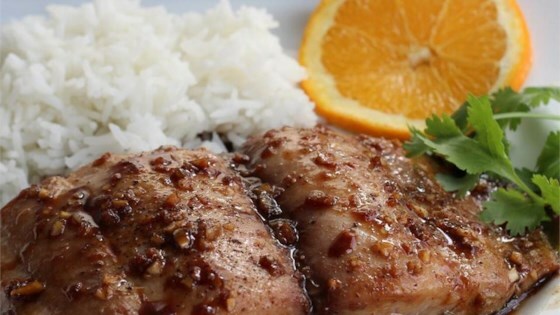 "This Ginger Glazed Mahi Mahi is bursting with flavor and combines both sweet and sour taste sensations. The 30 minute prep time includes 20 minutes to marinate. This recipe is a snap and so delicious. You'll love it!" This easy glaze is rich-tasting yet light and healthy. I really wanted to like this, but I didn't enjoy it very much. My DH gave it 4 stars and I gave it 2. We really enjoyed this. I grilled the Mahi Mahi rather than pan frying and it was superb. The marinade/glaze is definately versatile enough to be used on shrimp, chicken, pork, and even beef.